Bibliography: Bartsch 55 (vol. 2); Illustrated Bartsch 55 (vol. 3, p. 356); for the series, see Hollstein 16–67 (vol. 1, p. 182) and 10–61 (vol. 7, p. 130); see also description attached to original DAC catalog card. 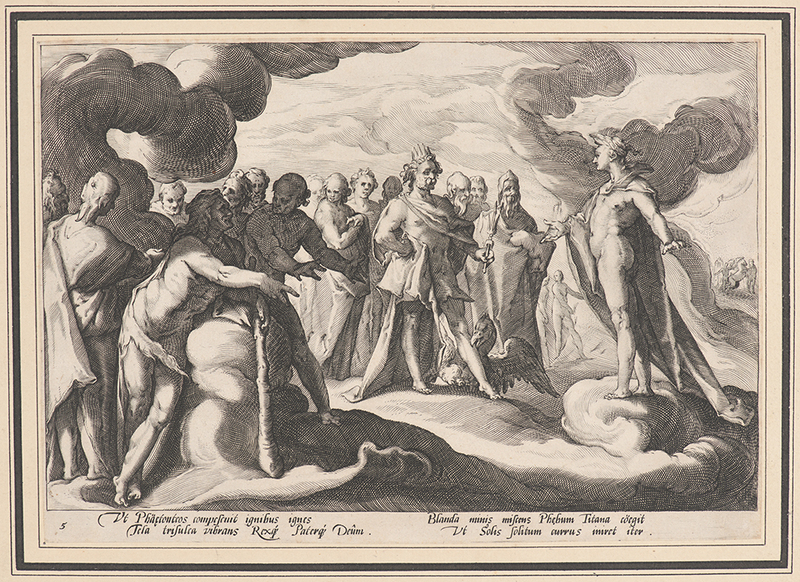 Jupiter and the Other Gods Asking Helios to Resume Control of the Chariot, . From Metamorphoses (illustrations for the work by Ovid). Engraving on laid paper. Undescribed first state. Plate: 177 x 252 mm (7 x 9.9 in.). DAC accession number 1968.29.3.25. Purchase funds, 1968. Open Access Image from the Davison Art Center, Wesleyan University (photo: M. Johnston). http://dac-collection.wesleyan.edu/obj1750 is a persistent link to this page with no user-session information.